Are you looking for 30 yard dumpster rentals in Bergen County, NJ for your clean-out or construction project? Crown Carting is a family-owned and operated company that has been serving residential and commercial property owners with a selection of different sized dumpsters for over ten years. When you are working on a project like renovating your home, working on a landscaping project, or de-cluttering your basement or attic storage space, there is a considerable amount of waste. If you are planning a large cleaning endeavor, or a construction project, you need a dumpster rental service to provide a temporary dumpster where you can store all the trash, and then have someone safely haul it away. At Crown Carting, we provide dumpster rentals, commercial dumpster rentals, and industrial dumpster rentals for residential and commercial clients, as well as government agencies.Our professional waste management specialists will help you choose the size dumpster that will be the right solution for your construction applications. Our waste management specialists are committed to customer satisfaction, so you can rest assured that our services are completed within your time-frame for an affordable price. For more information about our 30 yard dumpster rentals in Bergen County, NJ, call crown carting at (201) 941-2075. 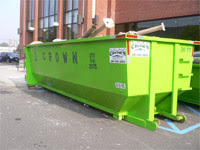 Crown Carting- your source for 30 yard dumpster rentals in Bergen County, NJ! Are you renovating your home, working on a landscaping project, or de-cluttering your basement or attic storage space? Home projects like this often leave you with a considerable amount of waste. Crown Carting is the solution for removing this waste from your property with dumpster rental in Bergen County, NJ. At Crown Carting, we provide homeowners and commercial property owners with affordable dumpster rental in Bergen County NJ. For over ten years, we have been many home and business owners source for tossing out unwanted waste with prompt and professional service. We emphasize that every customer is treated with respect and pride ourselves on making sure your dumpsters needs are fulfilled. Our dumpster rental company will deliver the receptacle to your home, and then come and pick it up once you are successfully done with the disposing of your unwanted waste. If you are unsure of the type of dumpster you may need, our experienced staff will help you figure out the receptacle that is recommended to match your needs. Whether you have small project like ripping up an carpet or getting rid of old furniture, or a larger scale project like building an additional room onto your house or a larger commercial construction, we will provide you with the appropriate dumpster, in the size that is the recommended fit. No matter the size of the job, we have a dumpster to remove your unwanted waste. Our dumpster rental company is able to coordinate all of our dumpster sizes, creating an easier waste management process for you, so you can concentrate on making your home, office, or yard a better place to be. Our dumpster are available in sizes up to 40 yards, and we offer daily, weekly, and monthly dumpster rental in Bergen County NJ to ensure the job is completed within your time-frame. While dumpsters come in all sizes, our smaller ones usually hold about four tons of material, while larger ones can hold over eight tons. No matter the size, the next time you have to get rid of unwanted waste, call Crown Carting, and rent one of our many dumpsters, it’s as simple as that! For more information about our large and small dumpster rental in Bergen County NJ, call Crown Carting at (201) 941-2075. It’s finally spring - and for many people, that means it is time for spring cleaning. Projects like that often mean a lot of trash, even for those who would prefer to donate their unwanted goods to a local charity. If you are planning a large cleaning endeavor, or a construction project, call on Crown Carting for your dumpster rental in Bergen County, NJ. With a dumpster right on your property, you can store all your trash and then have Crown Carting safely haul it away. But to help you make the most of your dumpster rental, you should know that there are some items that cannot be accepted by our trash hauling services. These particular items require different disposal processes, and knowing a little bit about what is not allowed ahead of time can save you hassle and expense down the line, and help you select the appropriate dumpster for your needs from our wide variety of sizes. Even if you rent a large, 40 yard dumpster from Crown Carting, you still cannot just chuck anything in it. Some restricted items are more intuitive than others; for example, it probably comes as no surprise that gasoline and propane tanks, even empty, are generally not allowed in rental dumpsters because of the risk of chemical contamination or fire hazards. If you need to dispose of propane tanks, many gas stations and grocery stores will take them off your hands—and some may even pay you a little bit for them. Similarly, gasoline tanks are often accepted by auto shops, who are equipped to dispose of them. Your dumpster rental in Bergen County, NJ has to follow certain codes and regulations pertaining to the town, county, and state laws. Some of these regulations govern the disposal of chemical products in landfills. Even if a chemical does not pose a fire hazard, anything that could contaminate the landfill is forbidden and cannot go into a rental dumpster. Luckily, small amounts of cleaning chemicals can be thrown in your ordinary trash, as can most paints, and you can contact your local waste service for instructions on how to properly dispose of them. For larger amounts of these items, you might need to contact a specialized service. Although they do not pose any chemical or fire risk, tires are not accepted by many landfills, and as such they are also not allowed by dumpster rental services. That said, it’s generally pretty easy to get an auto shop to take them off your hands for you. These days, many tires are being recycled to conserve the environment and space. You will be happy to know that your old tires won't just be sitting on top of a mountain of tires somewhere once they are properly turned over to an auto shop! Undertaking a large cleaning problem is enough work without having to fish through the trash for items that might not be accepted afterwards. By making sure that the above items are not among your trash, you can make the most of your Crown Carting dumpster rental and save yourself both time and money! For any questions regarding dumpster rental in Bergen County, NJ, contact the professionals at Crown Carting today at (201) 941-2075. You’ve finally made the decision to clean out your garage, attic, basement, shed, or whatever large space that’s been collecting junk for years. But what do you do with it all? Your local garbage collectors won’t take big bulky items. You certainly don’t want to haul the stuff to the dump yourself. And you don’t want to waste a weekend on a garage sale that will only get rid of a fraction of the stuff. The solution? Dumpster rental. The dumpster rental company will drop a dumpster on your property for any length of time. You simply fill it up and then they’ll haul it away. Crown Carting is a family-owned and operated dumpster rental company proudly serving North Jersey residents since 2002. We feature dumpsters ranging in sizes up to 40 yards, efficiently containing all materials no matter the size of your cleanup project. We distinguish ourselves by offering an affordable dumpster rental cost in Bergen County NJ, expert service, and prompt delivery and pickup of our dumpsters. So how much will is the dumpster rental cost in Bergen County NJ, you’re asking? Admittedly, dumpster rental prices can be difficult to gauge. Your final price depends on many factors like the size of the dumpster you need, the length of time you need it, and what type of stuff you’re throwing away. If your junk needs to be hauled to a landfill, then that cost will be passed on to you. 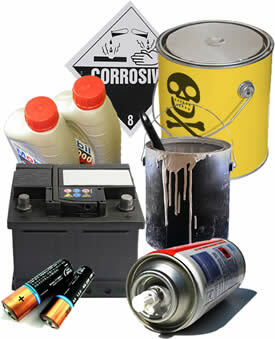 If you are throwing away hazardous or recyclable materials, they require special handling and that too adds costs. What will you be putting in the dumpster? What date do you need delivery? What are the fees if I go over the anticipated weight? What happens if I need to rent the dumpster for longer? 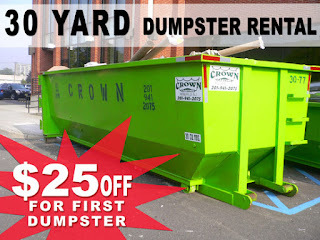 For more information about our dumpster rental cost in Bergen County NJ, call Crown Carting at (201) 941-2075. If you’re looking to demolish any structure, large or small, our team of experienced and knowledgeable professionals are here to help. Demolition in Bergen County NJ can be very sensitive and dangerous situations that need to be handled by professionals that know the demolition process well. Our team sets out to demolish a space in the safest and most efficient manner possible. At Crown Carting, we ensure remarkable results allowing you to refashion land the way you envision. Our affordable demolition in Bergen County NJ features the necessities to promptly complete the demolition project, including our own containers, mini-excavator, and Bobcat. Whether you are in need of interior or exterior demolition in Bergen County NJ, our highly skilled professionals are available to bring you the results you are looking for, at prices to fit your budget. We’re going to discuss why it’s ideal to choose our demolition team to demolish and clear your space. First and foremost, safety is of the utmost concern to our team. It is our priority to ensure the proper safety procedures are followed. This means having our team evaluate the entirety of the grounds to have a complete understanding of how to proceed with a safe, and secure demolition. Demolition requires plenty of very destructive and heavy machinery and equipment. Having well-trained, knowledgeable professionals to work these machines is essential. Whether it be a wrecking ball or an excavator, they require individuals who truly know how to operate and conduct this machinery in a way that minimizes risk factor, but maintains an efficient workflow. Having the right team with the right equipment is crucial for a successful exterior or interior demolition in Bergen County NJ project. Old structures and newer structures take very specific procedures to properly demolish them. Our team not only offers the proper machinery but the professional experience and talent required to expertly produce a positive demolition result. We ensure absolute professionalism, expertise and an optimal demolition service. If you have any questions about our demolition services please feel free to contact us. We’ll be happy to address any inquiries or concerns you might have. For more information about demolition in Bergen County NJ, call Crown Carting at (201) 941-2075. It can happen to anyone, items in your home can begin to aggregate over time and if gone unattended, can be the cause of an overwhelming cluster. If you are feeling overwhelmed with the materials piling up there’s no need to worry, our junk removal company in Bergen County NJ is here to help you clean up. Junk removal is not nearly as daunting when you have a group of trained professionals to help you through the process. At Crown Carting, we specialize in junk removal services. By providing reliable, quality solutions to meet your complete satisfaction, we have established ourselves as a trustworthy, hard-working junk removal company in Bergen County NJ. Our work efficiently and expertly removes junk from your property without interfering with the surrounding property or environment. Our integrity and work ethic shine through our many jobs completed since beginning in 2002, and we proudly assist Bergen County residents and property owners in need with timely, professional service. Here we’re going to discuss why it’s a good idea to have a junk removal team on your side. Our junk removal company in Bergen County NJ will save you loads of time and energy during the cleaning process. One of the main issues when it comes to taking on a big cleaning job on your own is that it does tend to take hours, maybe even days to complete the job. Not only that, but the endless cleaning can really take a physical toll on you. Take a break - you deserve it! And let us take this big cleaning job into our own hands. We'll help you get rid of all the junk that’s piled up so that you’re free to do what you’d like and enjoy the new, open spaces. The way the newly removed junk is organized is also of great importance. When the materials are removed from you space they’re organized in a way that distinguishes trash from things that can be salvaged, recycled or donated. So not only do you benefit from a newly clean space, but many people could benefit from the materials donated after the removal process. Removing all the junk from your home will not only relieve you of clutter, but also stress and potential health hazards. A densely cluttered space can cause one to feel anxious and powerless to clean it. Our affordable junk removal company in Bergen County NJ will help do away with that so you can move about freely and enjoy your new, open space. For more information about our affordable junk removal company in Bergen County NJ, call Crown Carting at (201) 941-2075. Spring is officially upon us, and for many, this means cleaning out our homes or properties. Sometimes, we aren't quite prepared to tackle the amount of items we've decided to toss - causing stress and frustration. How are you going to get all this "stuff" off of your property? Fortunately, our waste management company in Bergen County NJ has solutions to make your spring cleanup a breeze. Crown Carting is a family-owned and operated waste management company in Bergen County NJ serving residential and commercial property owners with prompt and affordable waste management services. Whether preparing for the spring or moving your office across town, we feature a slew of options to make your cleanout much more efficient. Our customers have come to rely on our services when they need professional rubbish removal or dumpster rentals. That's because we stand behind principles that place emphasis on treating you with the respect and consideration you deserve. At Crown Carting, "the customer is king!" When preparing to de-clutter your home, organize items into three piles: donate, trash, and recycle. This streamlines preparation and makes the process of throwing things away much simpler. Freeing your home or office of unwanted items before spring rain begins is good practice, making for a much less stressful and hazardous project. Our waste management company in Bergen County NJ is here for projects large and small. With containers available from 1 to 40 yards, we have the size you need. Likewise, we are flexible with our rental times, ranging from days, weeks, and months. Our trucks are ready and available to reach your location without delay. Whether residential, commercial, or industrial, we have the right sized dumpster to complete your rubbish removal project. For more information about our affordable waste management company in Bergen County NJ, call Crown Carting at (201) 941-2075.